I wondered if anyone can help me to place the whereabouts of this cafe. It is a postcard photograph, posted in 1939, on the back of the photo is written – Dora running the Brown Teapot, Brighton. – The name over the door is – K Rivett Drake. If you can help identify the shop, please leave a comment below. Next to one of the churches in Lewes Road? On the left coming from the Level? It looks a bit like Rottingdean? I’ve got a feeling this was in the Laines area, maybe Lower Market Street…fingers crossed. Also there was a Dame Rivett-Drake residing in Hove at that time. Kelly’s Directory for 1938 does not list this under teashops or cafes, in Brighton or Rottingdean. The only Rivett-Drake is Mrs Dora RD at 101 Goldstone Crescent. 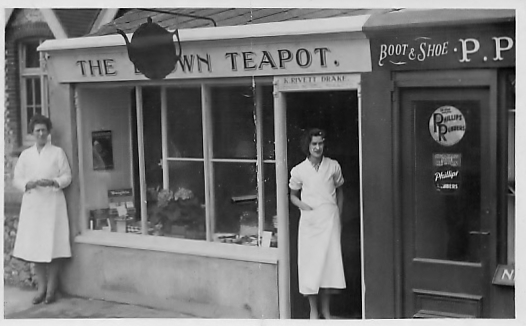 In the 1949 Kelly’s, the same lady is at 39 Upper Abbey Rd, Kemp Town, Brighton. No indication anywhere in either volume of the Brown Teapot. A few years back a Dame Jean Rivett-Drake was [I think] a Lord Lieutenant of East Sussex. It could be in Patcham old village looking at the house next to it? Dame Jean Elizabeth Rivett-Drake was Mayor of Hove 1977/78 but only a Deputy Lieutenant of East Sussex. She was also Brigadier and Director of the WRAC (Womens Royal Army Corps) 1961-64. According to the London Gazette, a Dora Rivett-Drake of 87 Hove Park Road, Hove, died on 19 May 1968. I agree with Maggie that it looks a bit like Rottingdean. I suspect that Dora Rivett-Drake was actually born Dora Rivett, and married Bertram Gregory Drake in Stockport in 1908. This couple had raised two children by the time of the 1911 Census: daughter Elizabeth (aged 1) and son Rivett (also aged 1). The births of a Keith Rivett Drake and a Jean Elizabeth Rivett Drake are recorded in the September quarter of 1909 in Bucklow, Cheshire/Lancashire. They were both born on 13 July 1909, so I suspect they were the twin children of Dora and Bertram. In 1935, Dora Drake, the “widow of Bertram Gregory Drake”, and now living at 14 Bellevue Gardens, Brighton, officially changed her name to Dora Rivett-Drake. We are told in Helena Wojtczak’s book, “Notable Sussex Women”, that Dame Jean Elizabeth Rivett-Drake (Mayor of Hove 1977-78) “was born into a prosperous Lancashire family”, “moved to Sussex in the late 1930s” and “lived at 87 Hove Park Road, Hove,” which is where Dora Rivett-Drake died on 19th May 1968. Dame Jean had already changed her own name in 1951 to Jean Elizabeth Rivett Rivett-Drake. It would appear that the name over the door of “The Brown Teapot” café is that of Dora’s son Keith, whose death I believe occurred in the Hove area in 1992. It seems he may also have adopted the double-barrelled surname to become Keith Rivett Rivett-Drake by the time he died. I just wish I could pinpoint the site of the café, but I suspect it has since been re-developed. Perhaps it was in Kemp Town if Dora was living in Bellevue Gardens around that time. Thank you Geoffery and Alan for the info, which seems to have Dora sorted. I think it would be nice if we could pinpoint the shop. I think when the war started the cafe would have closed. The name over the door was licensed to sell tobacco – was it a tobacconist previously I wonder? Like you Andy, I couldn’t see any shoe repairers with first and last names beginning with P when I looked in the Brighton History Centre directories last Saturday, so I’ve just looked for a Percy P Hilton on Ancestry here at home. There is a birth of a Percy Phillip Hilton in the March quarter of 1900 in Lewes Reg District (which includes Rottingdean), and a death entry in September quarter 1957 Brighton, which gives the birth year of 1900. Percy Hilton, aged 11, born Rottingdean, is in the 1911 Census for 26 Rugby Place, Brighton, son of Sampson and Jemima Hilton. He and two other siblings were born in Rottingdean. On the other hand, a Percy Hilton, born 2 Feb 1900, is working at Brighton Station on 24 August 1916. Did he later become a shoe repairer in his home village? Over to you Brian, I think! Further to my earlier response, Percy Philip Hilton was born in Brighton but registered in Lewes in 1900. Thereafter he appears in Rottingdean as Percy P Hilton in the 1901 census. As two of his brothers had an occupation of ‘Boot Boys’ at the nearby college, it is almost certain this is the same Percy Hilton at Nevill Road. With reference to Brian’s last comment, there was also a tobacconist shop next door to this Nevill Road Boot Repairer at that time – not proof absolute, but circumstantially overwhelming evidence to indicate this was Nevill Road, Rottingdean. Regards. Good work Andy, and well done also to Maggie Williams (09/06/2012) who thought it was Rottingdean. I had more than a passing interest in Dora, as I discovered from the responses that she had at one time lived in my present house! Brian, these two shops and the building to the left, which is set back behind the low flint wall, can be seen in Douglas D’Enno’s recently published book “Rottingdean through time”. On page 31 there are two photos of Nevill Road, ‘then and now’. In the earlier photo, the two shops, with their distinctive roofs, can be seen in the centre of the photo. They are, as suspected, at the lower (eastern) end of the road, on the north side, near High Street. Regards. Thank you Brian Hough for this interesting page. Percy Phillip Hilton, born 1900, died 1957 (a Rottingdean man). Percy is buried in St Margaret’s churchyard together with his wife Dorothy who died in 1969. Elsewhere in the churchyard can be found the graves of Nancy Katherine Fisher Hilton (Rottingdean Village school teacher), born 1903 died 1998, and her sister Maud (writer) – I wonder were these two ladies Percy Hilton’s sisters or part of an extended Hilton family who lived in Rottingdean during the last century? The Brown Teapot was before my time. However, I do remember the two very small shops in the photo, I recall bookmaker Jack Callaghan occupied one of them in the 1960s. Most of the lower part of Nevill Road was redeveloped during the 1960s/early70s. Sadly all those lovely historical buildings there, including the two village schools, were lost forever. On the extreme left of your photo, Brian, is the Infants School. The low flint wall adjacent to the cafe is the boundary of the little playground in front of the school. On the other side of the road was the National Mixed School of 1860. It faced the cafe, but has long since been replaced by the current Royal Mail building, with its pseudo flint walls. As Christopher said, the schools were a sad loss, though the Reading Room of 1885/86 is still there at the junction of Nevill Road and High Street, on the north west corner of the junction.